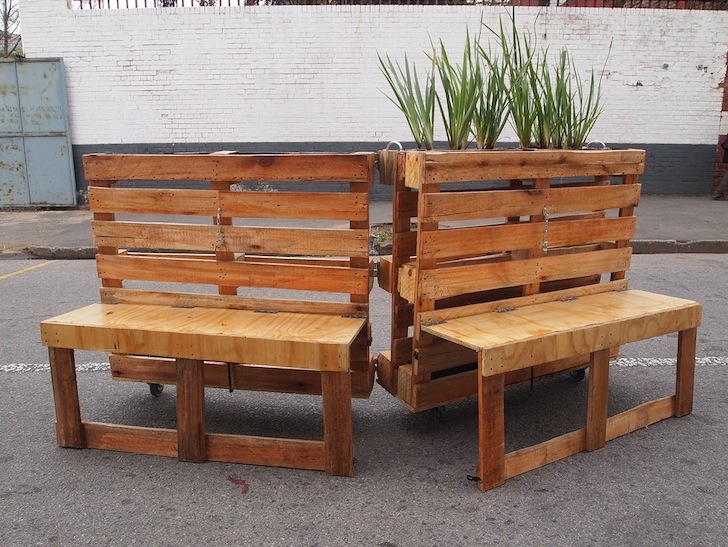 Street artist r1 recently unveiled "Brothers in Benches," his latest urban intervention that recycles reclaimed wooden pallets into six interchangeable mobile benches. 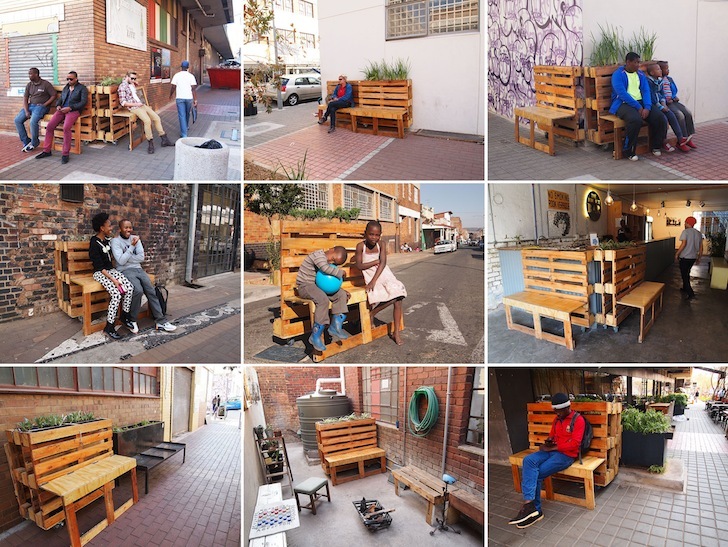 Artist r1 set the installation on wheels and rolled the pop-up seating throughout the heart of Johannesburg to observe how the public interacted with the playful street furniture. The project was created as part of South Africa Absolut's residence program that gave six artists just two weeks to create artworks adhering to the brief "Transform Today." During the Absolut residency, the six artists shared an apartment in Jeppestown, Johannesburg where they exchanged ideas on how to design creative solutions to the city’s issues. “The theme of the project was for us to transform the immediate surroundings and engage with them in a creative way,” says r1. The street artist also teamed up with Sam, a local resident who makes upholstery couches, to create the upcycled folding benches. Each wooden unit comprises three interlocking components: a central planter flanked by two benches with retractable seats; the three components can be fully collapsed to make a compact shape or expanded like an accordion to create a variety of configurations. Sam and r1 also added three sets of wheels to the bottom of each structure to make the benches easily moveable. The artist placed the completed benches around the city, from street corners to alleyways, to see how residents would react to the new site furniture. The street artist teamed up with Sam, a local resident who makes upholstery couches, to create the foldable upcycled benches. Each wooden unit comprises three interlocking components: a central planter flanked by two benches with retractable seats. Sam and r1 also added three sets of wheels to the bottom of each structure to make the benches easily moveable. The bench can be expanded like an accordion to create a variety of configurations. "The theme of the project was for us to transform the immediate surroundings and engage with them in a creative way," says r1. The six benches arranged in an hourglass-like configuration. The project was created as part of South Africa Absolut's residence program that gave six artists just two weeks to create artworks adhering to the brief "Transform Today." The artist placed the completed benches around the city, from street corners to alleyways, to see how residents would react to the new site furniture.